The Vice Chancellor, Lagos State University, Professor Olarenwaju Fagbohun receiving a warm handshake from the Director General, Lagos State Sports Commission, Babatunde Bank-Anthony after the presentation of the sports equipment to the management of LASU today at Hussam Thomas Okoya Indoor Sport Hall, LASU Sport Complex. The Vice Chancellor, Lagos State University (LASU), Professor Olarenwaju Fagbohun has urged the Director General, Lagos State Sports Commission, Babatunde Bank-Anthony, not to relent in his efforts in improving the standards of the university sports centre. He spoke against the backdrop of the university administration’s desire to make its sports center exceptionally equipped to facilitate its being a pride of the Lagos state University and Lagos State as a whole. In response to the University’s request, Director General, Lagos State Sports Commission, while presenting some sports equipment to the University management at Hussam Thomas Okoya Indoor Sport Hall, LASU Sport Complex, pledged to include LASU in the commission’s 2019 budget. 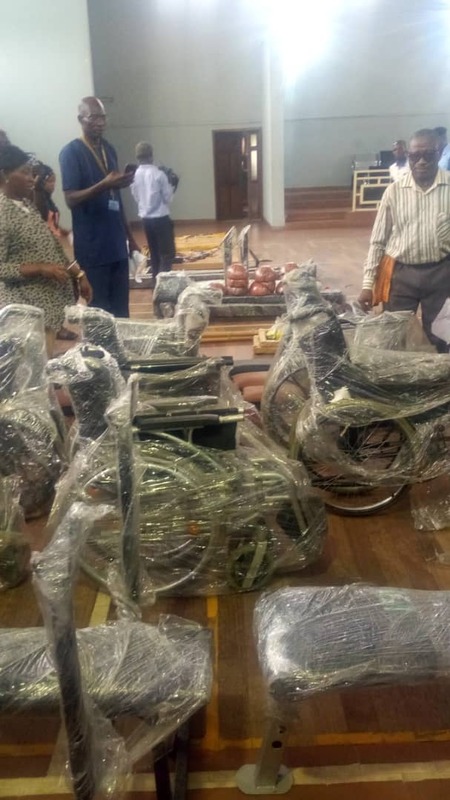 Some of the equipment presented by the DG includes two table tennis board, ten table tennis bats and rubbers, a pair of complete basketball upright, two volleyball net upright, three power lifting bench, complete set of power lifting weight, ten IPC waist band, ten match football, four power lifting wood chair, eight basketball wood chair, 35 table tennis net to mention but a few. Speaking on the equipment donated he noted that although they are few the commission is set to do more. The DG stated that the commission in his administration will put in place policies that will enable the sports commission to take LASU sports as part of their responsibilities even after his administration and the Vice Chancellor’s administration. The VC suggested that two or three people should be selected as arrow heads of the project and timeline should also drawn so as to achieve it’s desired goal. The VC assures the commission that the University will make very good use of the equipment such that Lagos State and Nigeria will be proud of the facilities and the output that will emerge from these equipment. Speaking on his satisfaction with the equipment the VC said ” the journey of a thousand miles begins with a step, the DG has demonstrated the desire to continue supporting the University with the sports trust fund, within a short time Lagos State University will be a prime place in terms of sports facilities. A federal judge in Maryland said Thursday that Christopher Hasson, a Coast Guard lieutenant accused of plotting a domestic terror attack, will be released from detention.